Wait A Minute, I'm Looking For Bass, Not Structure! Contour Maps Won't Show Me Where Bass Are! Well you better be looking for structure first and knowing how to read map symbols and GPS map coordinates on fishing lake maps to locate structure is like using a treasure map where bass are the treasure. Find structure with your map, even cover on that structure as a bonus, if you want to find bass because that's where the bass will be. Sure, you can locate structure with your depth finder while on the water, but you'll spend a lot of fishing time looking rather than finding. Take some time prior to getting on the water studying some fishing lake maps. Study the legend map symbols. Learn to recognize these map symbols, understand the map scale and visualize exactly what the contour lines are telling you. Do this and you're ahead of the game. 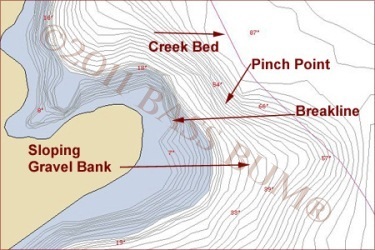 The most fundamental of all symbols on fishing lake maps is the contour line. These tell you at a glance the rise and fall and overall shape of the bottom of a lake or river. This is important why? Because the changes in bottom configuration are otherwise known as structure; the god of bass location and treasure chest of bass anglers everywhere. The closer they are together the steeper the drop into deeper water. The greater the space between them the more gradual the slope. 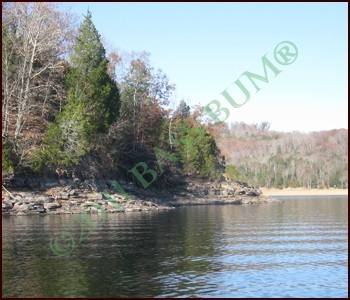 You will find that fishing lake maps have numerical indicators on their lines that indicate water depth. These vary by publisher as to the number of feet between contour lines. Many are ten feet between lines but those that have five feet intervals are better I think. The best are those that have only one or two feet between them. I've only found the latter in digital HD versions provided by Navionics. I also use maps from Fishing Hot Spots, a section of which is shown at right, because, despite the ten foot intervals, offer good detail showing "cover" that the digital map from Navionics does not. I find that the Navionics Hot Maps Explorer digital HD maps are great for trip planning and the paper maps from Fishing Hot Spots and Atlantic Mapping are good for use on the water. Yes, most of us who fish from boats use some combination of depth and fish finders. There are models available today that see up, down, sideways, every which way. That's great, if you can afford one without mortgaging everything you own to get it. If you can't, like most of us, you rely on a more modest version of fish depth finders and compliment it with fishing lake maps. 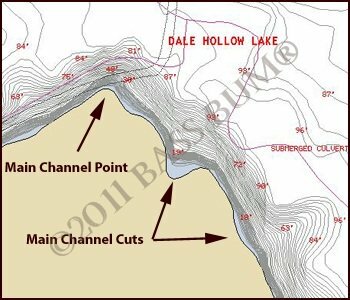 Lake fishing maps are great bass finding tools, whether you have a boat fish finder or a portable fish finder or not. Contour maps serve to prepare you for your trip by revealing prime lake structure and giving you a blueprint to get to it. Electronics then serve to fine tune what you see once you get to the structure you identified on your hydro-graphic map. Once on the water you search less, fish more. Burn these into your brain. These features are your high percentage bass locations, year round. There are some seasonal variations but tracking studies have determined that seasonal influences relate to where on a piece of structure bass may locate, not whether they are there at all. Find these on a map then head to them when on the water. Once there determine if they also have cover on them. Next, determine the depth where the bass will most likely be (seasonal influence) and start fishing. Let's look at these primo underwater structures as they may appear on reservoir contour maps. 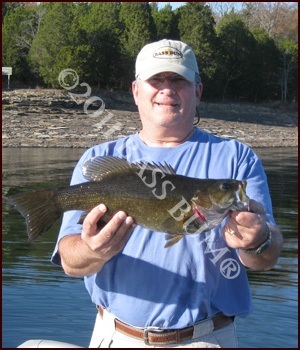 Find a channel point or a secondary point with the right combination of cover and you will find bass. They offer bass a passage from deep to shallow water and are a preferred hunting ground for baitfish they can "pin" against the breaklines of the point. The picture at right is the very point and cut shown in the contour map image above. Bass and baitfish will use points as paths from deep to shallow water and they become real killing fields when bass herd baitfish against the point's sides cutting off escape. Bass also lie in wait on the down current side of points for baitfish and slurp them up as they travel over the point. Sometimes considered submerged islands, humps are a mass of bottom that projects up toward the surface and is surrounded 360° with deep water. Submerged islands and humps will appear the same on contour maps. Humps are magnets for baitfish particularly in the spring and fall months and where there are baitfish there will be bass. 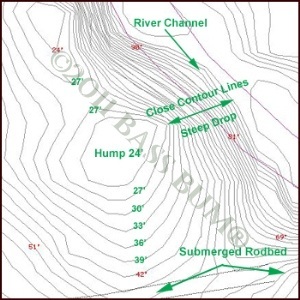 Humps in deeper water are gathering places for bass in the summer, especially if close to a river channel, as are the ones shown in the image below. Baitfish use river channels as migratory highways and if the channel passes close to a hump it's like a bass angler passing an exit on the interstate that has ten fast food places. We're gonna stop if we're hungry. 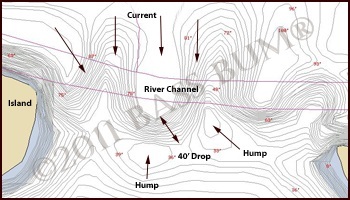 The image below shows a hump that is found almost in the middle of a major secondary creek rather than in the main channel. It has a small flat 60' across on top and its two sides drop fairly quickly. There is a saddle between the hump's top and shore. The side that extends toward the center of the creek gradually drops from 33' to around 51' of water over a distance of 156'. This very gradual drop is clearly shown by the distance between contour lines. This type structure, located midway back in a secondary creek, would without question serve as stopping point in spring when bass are moving from deeper water to the more shallow back of creeks to spawn. You would likely have difficulty finding this type offshore structure or even knowing it was there without studying contour maps prior to getting on the water. Submerged creek and river channels, most often found in reservoirs, are migration routes used by baitfish and bass alike. 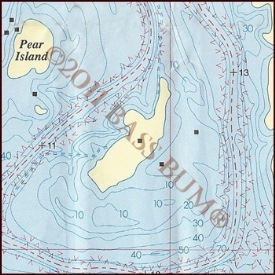 In the map section shown the former river channel runs parallel to a point formed by the main channel and feeder creek. Additionally, the point starts off with some grass on a wide shallow flat before dropping at a breakline down to another deeper flat 24' deep that runs for almost 300'. The channel will bring both bass and baitfish to this point and flats on their way into the feeder creek prespawn and again in fall when they migrate back to deeper water. 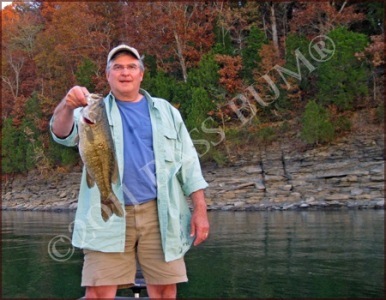 If you fish for smallmouth bass or spotted bass look to rocky bluffs in spring or winter months. The craggier the better. But bluff walls are really bass attractors most of the year. One reason is because they tend to be near or form a side of a former but now submerged river or creek channel. The interstate highway system of the bass and baitfish world. When you're studying contour maps before you head to the water if you find a point at the end of a bluff you just hit a triple. If the point is a main channel point or at the mouth of a major secondary feeder creek, over the fence! 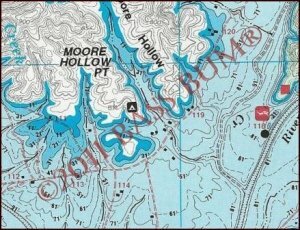 The map shown above is of a bluff, with a point at the mouth of a major creek. To make it even better, there is also a submerged road and road intersection (point A) and creek channel running over the roadbed (point B) close to the bluff and out to the main channel. Makes my hands shake and my mouth water just thinking about it. As a matter of fact, the guy in the picture holding the nice smallmouth, that's me, and the picture was taken right where this map shows. That's the bluff in the background. Caught in late October about 4:30 in the afternoon. Sun was on its way down, air was cool, life was good. Quite frankly, times like that are the "Kiss of Life". 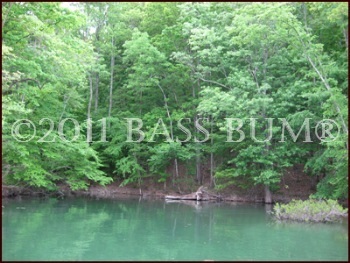 This particular bluff, as do many, most always has bass on it, regardless of season. When you find them on your contour maps seek them out, don't pass them up on the water. Gradually sloping banks that are gravel covered but otherwise devoid of obvious cover. That's what is shown by the contour lines in the map section above. Such banks run contrary to the universal emphasis on cover as the second critical ingredient in the structure plus cover recipe. No wood laydowns, stick ups, no stumps, rock piles or vegetation. No bass on this wide open, nothing bank we think. Certainly, cover and structure together create the odds on favorite that bass will be around. However, banks that appear unproductive can sometimes be just as deceiving as can one that looks, "fishy", like the one at right. Don't you hate that word? But I bet you think it, even if you don't say it, when you see a bank, drain, cut or cove that has all the right ingredients. Then you fish it and zero, nothing! So here is an example of why it's important to check contour maps before fishing. Check out the bank behind me in the picture. It's the very bank shown in the map above. That smallmouth came off that bank, hooked right where the pinch point is on the map. What does the map show we can't see above water? 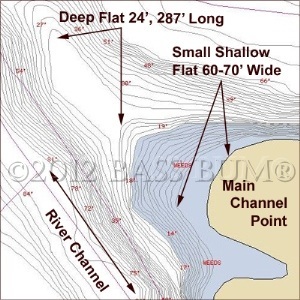 In this case, while the bank looks to be an uninteresting gravel bank, below water there are some structural features that have bass attracting appeal. A breakline, a pinch point on that breakline and a creek bed. Hot damn, good stuff! Sometimes.